Bobcats are a medium sized member of the cat family residing in the United States. They move like a house cat, have a bobbed tail and vary in color from brownish black to a reddish brown depending upon just where the cat is residing. These animals are secretive and move about primarily during the evening and late night hours before sunrise. Their numbers have been on a steady increase and encounter with Bobcats are not nearly as rare today as they were just ten years ago. Abundant rodent populations have enabled this predator to rebound across our nation and though not a problem, Bobcats will prey upon local birds, cats, and dogs. Control methods must be employed when they start killing domestic pets and livestock. This article will detail some basic biology about bobcats and then offer several solutions which can be used to help get this mysterious and sometimes destructive predator under control. Bobcats are 2-3 times the size of the typical household cat. They are clearly stronger and tougher looking which is easy to see when they are observed in the wild. Males are larger than females; it is not uncommon for Bobcats to reach 40 lbs or more in weight. Bobcats can be found in any of the lower 48 States of America. They will readily live in river bottoms below sea level and can be found almost two miles up in certain mountain ranges. At this time they’re commonly found in urban areas and seem quite at ease roaming through any community where people and pets abound. Bobcat walking across street with bird in mouth. Bobcats are secretive and shy and will almost always see you before you see them. They like to travel at early evening, throughout the night and return home in the early morning around daybreak. Bobcats will keep an average range of one sq/mile but will travel more if food requirements make them forage further. Since they don’t mate for life, males will seek females during mating season which causes them to travel great distances. Many times this forces them to relocate altogether abandoning old ranges. Most breeding seasons start in January and will run for several months depending on the region. Female bobcats will carry young for 2-3 months, and litters typically have 2-4 kittens. Bobcats grow rapidly, but they still take a full 1-2 years to mature. Average life is about 12 years in the wild. Bobcats keep very specific travel patterns along with very specific territories. These territories are marked with urine and other scents excreted by the adult cats used as both markers and mating communicators. 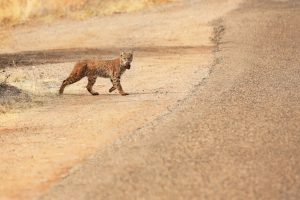 Once boundaries are established, adults will travel along trails daily looking for food, other bobcats and anything else which is spotted that piques their curiosity. Bobcats will feed on a broad range of food including something as small as a lizard to something as large as a deer. They will readily eat rabbit, chipmunk, rats, mice, squirrel, porcupines, gophers, prairie dogs, woodchucks, opossum, raccoon, domesticated cats, and dogs as well as several reptiles or amphibians. Bobcats love birds and will readily feed on quail, pheasant, turkey, grouse, chickens and any other flying animal which makes itself available. Bobcats will promptly make any local farm a sure stop feeding on several types of livestock as long as it is accessible and doesn’t offer much resistance. It is because of their predatory feeding that Bobcats get into trouble. When left alone in the wild they are barely noticed; once they are found killing livestock Bobcats will be targeted with a vengeance. They will readily seek sheep, poultry, goats, game birds, turkey, fish, calves, cats and dogs. This behavior is costly to farmers and cattlemen and since bobcat will many times kill and not consume their prey immediately, they are perceived as wasteful. In fact, Bobcat will hide or leave their kill for a later date returning every day or so to grab a meal. Though they may eat a mouse or rabbit at one sitting bobcat rarely do this with deer or sheep. Instead, they will make the kill, feed a little and then hide it away by covering it with sticks, brush, dirt or anything else they find close to the kill which will serve as a protective cover. It is this characteristic which makes them easy to trap using several methods which will be explained later in this article. Bobcat activity is easy to spot because they leave large cat footprints where they are walking. Animals killed by bobcat will have large claw marks on their backs and shoulders. Bobcats will begin to feed on large animals around the ribs or the neck and shoulders. Unlike the marks of a coyote which are rough and look as though the meat has been torn apart, bobcat will cut through flesh and bone quite smoothly. If you have found pets or livestock killed by a bobcat look for the claw marks along with a bite into the neck or head. These marks will be precisely located on the animal where such bites would have a quick lethal effect. Coyote hunt in packs and many times targeted animals suffer from many bites as the pack attacks from all sides. 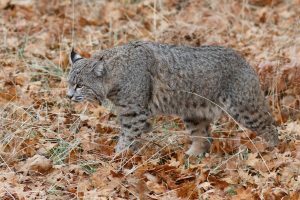 Although hunted for their pelts, bobcats are more likely to be pursued because they are either causing damage to local livestock or game animals. Farmers, pet owners, hunters, and cattlemen have all called bobcat their enemy. Though several are shot during any one year, most states don’t have a hunting season for bobcat. Trapping is how most are controlled. Local ordinances will have trapping seasons that vary from a month to half a year. However, predatory animals which are causing destruction can be controlled at any time. Over the years control methods have included everything from leghold traps to snares to live traps. The next part of this article will detail these methods and offer suggestions and guidelines as to which are better suited given different situations. There are several methods for dealing with an active bobcat population. In this article, we’ll cover traps and repellents. Either can yield positive results depending on your goal. 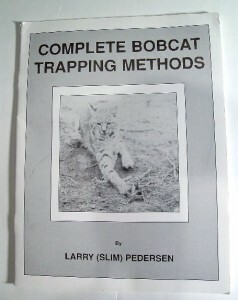 If you have unwanted bobcat activity and have decided to take action, a good read on what you need to do is covered by Pedersen in the COMPLETE BOBCAT TRAPPING METHODS handbook. It comes with some great photos, a lot of reference and material which enables you to know a lot before you ever start to actually trap. The reading is easy, to the point and helpful. 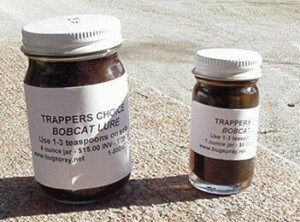 One thing you will quickly learn is that most trap sets will require at least BOBCAT URINE and in many cases, BOBCAT LURE. The urine is used a lot adult bobcat marking territory, marking dens, making a statement to other bobcat and for marking their food. To make a mark, plan on using 1-2 oz per spot. Bobcat lure is used for much of the same reasons. This pheromone based paste will pique the interest of any bobcat in the area and can be used to draw their attention to a trap. The proper use and implementation of these materials is widely discussed in the handbook and for anyone who has caught coyote or fox you probably have a basic understanding of how to take advantage of bobcat scent too. Whether you are a novice or a pro, using both Urine and Lure can be a big asset. If used incorrectly it can alert a cat that something is not right making them all the more hard to trap. Before we get into all the options you have for trapping bobcat, there are two devices we carry which can be used to keep them away from your home. 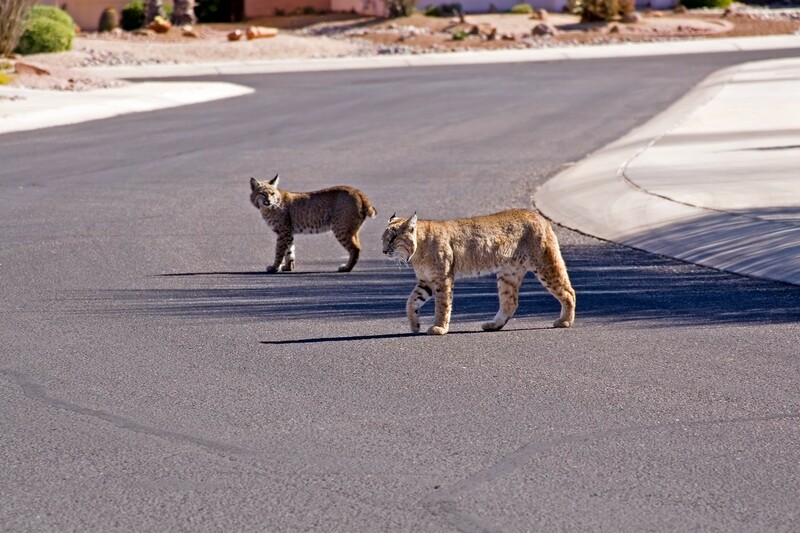 With Bobcat readily foraging in urban areas, the need to keep pets safe from attack is greater now than ever. Since Bobcat are hyper sensitive to changes in their environment, there are two ways one can disrupt their normal foraging patterns and make them uncomfortable enough to change their routes. The first device is perfect for applications around small ponds where pet fish are kept. Bobcat love these ponds and will frequently clean them out in a night or two. If you have such a pond and want to keep bobcats from fishing out prize turtles or fish, set up a MOTION ACTIVATED WATER SPRAYER. These devices use a motion detector which is able to “see” 24 hours a day. It connects to your garden hose and has a stake for sticking it securely in the ground. Once set, it has a range of about 105 degrees and will “look” for any motion entering its field of view. Once motion is detected, it will turn on and “spray” out a three-second release of water that will spook animals like a bobcat. In general, bobcat hate this device and how it behaves and they will typically run away when one deploys. They might try to move in from another angle, but a couple of blasts from the garden hose and they’ll stay away for good. 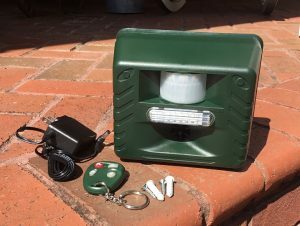 This device can be hooked up in series with several heads around your pond all ready to work at chasing away an unwanted predator like a bobcat. And since they can be set to spray around all the time, you won’t have to worry about local otters, dogs, cats or predatory birds from feeding in your pond throughout the night when you can’t see what’s active. Another option that does an excellent job of keeping bobcat away is our ULTRA SOUND AUDIBLE ALARM REPELLER. These units by default send out an ultra sound bobcats find stressful. Our unit can also send out an adjustable audible alarm as well as flash a strong LED light bar. This trio of repellers will frighten any bobcat from the area and keep them from coming back. These units can cover up to 5,000 sq/ft but they’re activated by a motion detector which will can only sense an intruder up to 30 feet away. So if you’re not able to locate the unit close to where the bobcat are entering your yard, you should choose to keep it active all night long using the included power supply AC converter. The ultra sound will travel up to 75 feet away and by itself is a strong deterrent. Conversely, using the motion sensor will work just as well and get fine results as long as its within range of the intruding cat. These come with a remote control “on/off” wireless controller which is handy. They can also be set to sound just at night instead of all day and night. Again, handy for bobcat which are nocturnal by nature. The setting for bobcat is best when configured to sound at “night” with the Ultrasound set to “motion sensor”. The sensitivity of the sensor should be set to 30 to allow for maximum range and the audible sound volume should be set to “80”. The frequency knob should be dialed to the middle setting which is effective on large cats. Be sure to line your property with enough units to properly protect the area and plan on getting 3+ months of use per set of batteries. And running the machine constantly using the included AC power supply will work just as well if you have power available outside. Mounting blocks can hold 1 or 2 units and can be angled up. Deploy units along property borders where cats are likely to enter your lot. Coverage is like a flashlight which means it will widen the further it gets from the device. But this also means the sound will be less powerful the further away the target. The ultra sound will be a deterrent for 75 feet or more; the audible sound can be heard for over a football field away.Units should be placed 1-2 feet above ground and pointed in the direction where animals are entering as well as “over” the turf you want to protect. For easy installation, MOUNTING BLOCKS are handy. They can accept 1 or 2 repellers (back to back) and have a 1/2″ hole on their bottom so they will easily fit over a 1/2″ piece of rebar or any other wood or plastic stake. Ultra Sound Repellers will work fine by themselves as long as you have a good place to set them up. But we highly recommend getting the Units with Mounting Blocks in the kits we offer. Mounting Blocks allow you to place units anywhere and they will save time too. If you decide you are going to trap a bobcat, there are several types available. 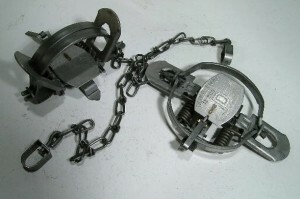 The most common and enduring trap is the BRIDGER LONG SPRING # 1.5 and BRIDGER LONG SPRING # 2. 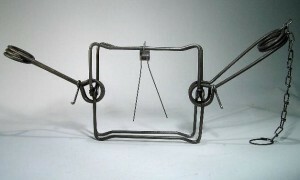 These are the original leghold traps now available in many sizes used to catch virtually any species of game animal. This works well for bobcat and can be effective when used properly. The long spring 1.5 has probably caught more bobcat than all other traps. Ideally suited for the average cat, if you’re trapping east of the Mississippi, this is probably the right size for your needs. The long spring has a jaw width of 4.75 inches which is plenty wide for the average Bobcat. 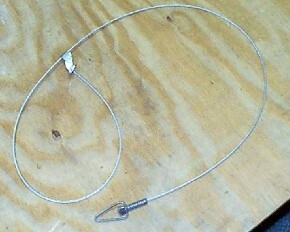 But if you’re trapping west of the Mississippi and believe you have a large animal, consider a #2 COIL # 2 TRAP. These have a 5.5 inch jaw width and work well on mid to large sized cats. Both long spring and coil traps are used the same way to make similar sets and can be used interchangeably. Good sets include trail stepovers, food location sets or flagging. Stepover sets are made on bobcat trails. Since bobcat will travel the same trail over and over, the concept of the stepover set is to place a log or rock in the middle of the trail causing the animal to step over it and into your trap. Locate the trap on the other side where the cat will most likely step. Bobcats don’t like to walk around anything and will very seldom detour from their normal path. Stepovers can be made without urine or lure. Food location sets can be done by using an existing bobcat food pile or by creating one yourself. Take common animal or other food and place it under dirt, leaves, sticks, ground cover, etc. to effectively mimick the behavior of Bobcats. The targeted animal will naturally be curious and get itself trapped once it starts digging up your artificial placement. These sets can be made a lot more effective with the use of both BOBCAT LURE and BOBCAT URINE (both listed listed above). Such food locations are generally marked and will need to have some scent applied for sure if it’s a fake mound being created for the set. Flagging is another set which works well for Bobcat. Place an animal part, hide or feather along the bobcat trail out in the open. Hanging it out in the open for all to see is needed and should be done. Cats rely on their sight more than scent so having the “flag” highly visible is a big help. Directly below the feathers or animal parts you can have either a coil or a longspring trap set. Covering it ever so lightly with loose sand or ground cover may help but is usually not needed. The use of some animal parts to add scent will help. This type of set takes advantage of Bobcats intuitive behavior to act like scavengers which feed on dead animals. Den sets are another very effective location where you can make a set. Such sets should be made where you know bobcats are living. You can tell if the den is active by inspecting the ground for fresh track, food, urine, gland scent or by seeing bobcats using it. Either longspring or coil traps will work for this type of set but another type of trap which works well for this set is the 220 BODYGRIP TRAP. 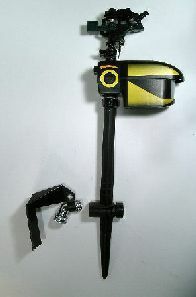 These are true kill traps which will effectively crush the head of any animal which tries to pass through the open jaws. Bodygrip traps come in several sizes and are used for many animals. Bodygrip traps can also be used where bobcat are known to be passing through a hole in a fence or where they are crawling under one. These passageways are ideal locations to place a Bodygrip since the animal will routinely attempt to pass through as it has so many other times before. The smallest bodygrip trap recommended for Bobcat is the 330. They measure 10″ by 10″ and will be large enough for a cat to enter. To secure the trap to the ground, use a TRAP STAND. Drive these into the ground so they remain anchored. Trap Stands can be used for pass through sets too. All of these locations are also great areas to make a set with SNARES. The big difference with a Bodygrip and a Snare is that the Snare will usually catch the bobcat and keep it alive where the Bodygrip will definitely kill the animal. Snares also cost less but they do require a lot more experience to use. Furthermore, animals caught live means you will have to deal with a very angry and aggressive animal so do take this into account and be prepared if you decide to use them. Our MEDIUM SNARE are strong enough for Bobcat. Remember to keep them securely anchored to a log or tree when making sets. Since bobcat can be hard to deal with once trapped in a leg hold or snare, consider a live trap which does a much better job of animal management. 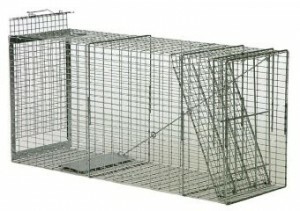 These heavy gauge steel cages are made to hold large strong animals and will handle even the most irritated cat. Our LT152248RD is well suited for the job and if order the optional “live bait cage” add-on, you’ll get fast results. Live trapping has become a lot more common as the way of catching bobcat has developed. Years ago this was not an option. However, as bobcat behavior has been studied, ways of luring the smart wary cats into cages has been tested and perfected. There are two things that should be done if you want to get a cat quickly. First, you need to conceal the trap. Do this by using pine straw or hay bales. Place the material on the trap sides, the back as well as the top. Try to create a “cave” like look which bobcats will regularly enter. Be sure to cover the wire bottom (floor) of the trap too using whatever the natural ground cover is where you are making the set. This could be more straw, hay or dirt. It’s also smart to locate the set close to brush, undergrowth, structure or anyplace where bobcat will feel comfortable walking. Don’t place it in the middle of a large field – it’s not likely to get any cats around it unless you know there is a trail there being used by your targeted animal. Second, the use of meat from bird to squirrel to beef will help to lure the animal inside the trap but something living and moving will work even better. One of the best sets to make is with a live rat or bird in our LIVE BAIT CAGE. This option can be wired in so you are able to place a bird, squirrel or other small animal inside by removing the back panel of the trap and opening the Bait Cage. 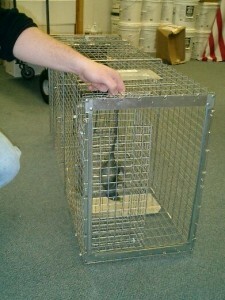 Once the bait is placed inside, close the cage, put the back of the trap back and make your set. 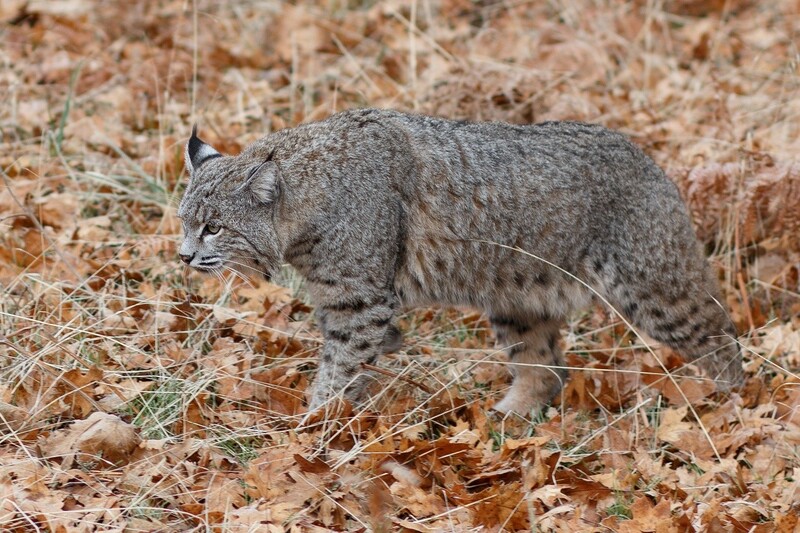 In most any case, the use of live bait will prove to be the best type of attractant when live trapping Bobcats. We offer the trap stock, with no bait cage but we also offer it with the bait cage built in. Either way, this trap is well suited for bobcat, fox and even coyote. It measures 15″ wide by 22″ tall by 48″ long. The picture below shows the bait cage attached to the trap along with a “rubber rat” inside to provide perspective. The bait cage measures 6″ tall by 13″ wide by 14″ long and when properly fitted in our trap, it won’t interfere with the mechanism. But if you already have a live trap, you can purchase just the bait cage and add it assuming you have a large enough space available. If you decide to live trap and make your set as detailed above, be sure to inspect it daily. Bobcat will travel through their territory at least once every few days and if you are not able to get interest than you probably need to relocate the trap to another run. Bobcat are a predatory animal which can exist alongside man without being seen. They have tremendous eyes and will avoid people at all costs. If you have one on your property and it’s feeding on livestock, game birds or something else you hold dear than you’ll need to trap them out. Get our hand book, learn how to make a few basic bobcat sets and then go ahead and give it a try. Once you have their trails well defined you should be able to trap out any animal causing damage. Once removed be sure to keep your eyes open and be ready to deal with the next one that moves into vacated territory. I think I once saw a demonstration of something you could post on your property near house to keep them away. There are several things that can be used to keep bobcat away from your house. 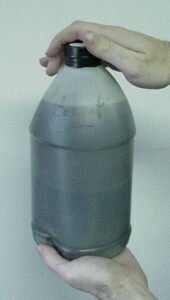 In our article above we highlight the Water Spraying Repeller as well as the Ultra Sound Repeller. Great article and that bait really worked. Caught one the first night after making the set. they definitely like it.